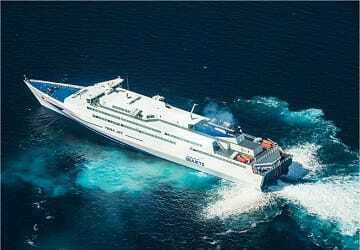 The high speed passenger ferry Tera Jet was built in Italy in 1999 and has a top speed of 40 knots, despite being over 145 metres long and 22 metres wide. Tera Jet has a passenger capacity of 2100 and a can hold as many as 600 vehicles in its garages below deck. Please Note: Whilst we have taken great care in making our Tera Jet guide as accurate as possible, onboard facilities, services and entertainment may vary depending on the date and time of year that you travel, facilities mentioned may change without notification and ferry companies reserve the right to operate vessels other than those mentioned at time of booking without prior notification. Excellent efficient service. Boat was on time, loaded quickly and crossing was very comfortable. We would definitely use this service again. Could not fault Direct Ferries on my recent trip from Heraklion to Mykonos on the Tere Jet was perfect in every way, The staff were helpful and bars were well stocked, Clean and efficient. Only one slight beef was that it was no smoking and got told off by an very officious woman. Other than that its a great service and enjoyable. Positive experience. Ferries are frequent enough, punctual and the general organization looks good. Seats on board are confortable and the crew give information in a really polite way. Nice trip. Punctual and fast boarding, nothing else to comment on. Slightly delayed. Comfortable seat. Efficiently managed boarding and embarkation. Comfortable journey but ferry delayed.